A four-week percent area reduction (PAR) for diabetic ulcers of 50% and a four-week PAR of 40% for venous ulcers have both been shown to be favorably predictive of 12 week and 24 week wound healing . Eighty percent (8 out of 10) of diabetic ulcers cases on whichDermavest and Plurivest were used had a four-week PAR greater than 50%. When compared to historical standard of care, this translates to at least a 96% probability that when Dermavest and Plurivest are used on diabetic ulcers, more cases will have a greater than 50% reduction in wound size over four weeks than standard of care. Sixty-nine percent (9 out of 13) of venous ulcers cases on which Dermavest and Plurivest were used had a four-week PAR greater than 40%. 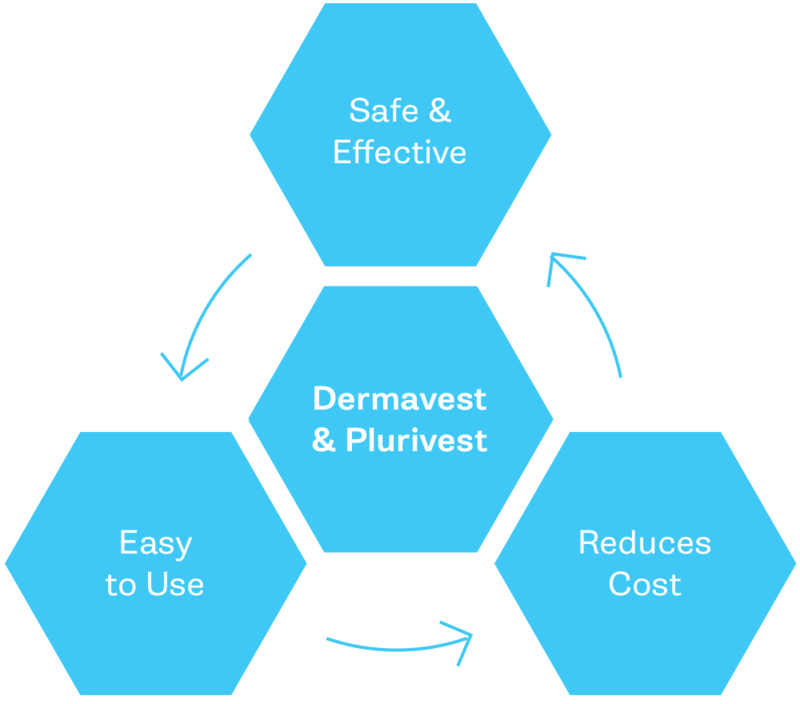 When compared to historical standard of care , this translates to at least a 94% probability that when Dermavest and Plurivest are used, more cases will have a greater than 40% reduction in wound size over four weeks than standard of care. Snyder RJ, Cardinal M, Dauphinee DM, Stavosky J, “A Post-hoc Analysis of Reduction in Diabetic Foot Ulcer Size at 4 Weeks as a Predictor of Healing by 12 weeks “, Ostomy wound Management 2010; 56 (3); 44-50. Serena TE, Carter MJ, Lam TE, Sabo MJ, and DiMarco DT “A Multicenter, randomized, controlled clinical trial evaluating the use of dehydrated human amnion/chorion membrane allografts and multilayer compression therapy vs. multilayer compression therapy alone in the treatment of venous leg ulcers”, Wound Rep Regeneration 2014; 22; 688-693. Zelen CM, Serena TE, Denoziere G, Fetterolf D “A prospective randomized comparative parallel study of amniotic membrane wound graft in the management of diabetic foot ulcers”, International Wound Jrnl 2013; doi: 10.1111/rwj.12097. Contact us to find out more and request a product demonstration. Learn how your practice can benefit with our complimentary reimbursement analysis.